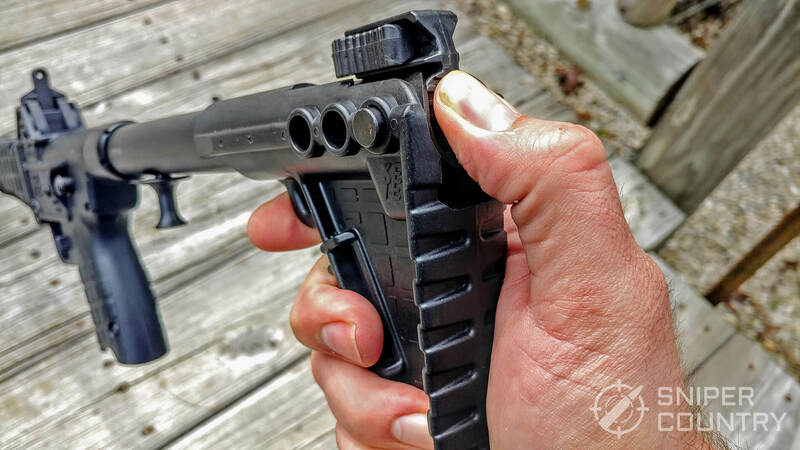 The Kel-Tec company, founded by George Kellgren, makes some of the most interesting guns on the market. In a market dominated by what seems to be an infinite number of companies producing AR-15s, Kel-Tec strives to be different. They produce interesting guns like the SU 16, which is a 5.56 semi-auto rifle that’s far from your typical AR-15. They even produce their own bullpup rifles in both 308 and 5.56. One of their most interesting and most affordable firearms is the Kel-Tec Sub 2000. The Sub 2000 is the subject of our review today. Specifically the Generation 2 model. 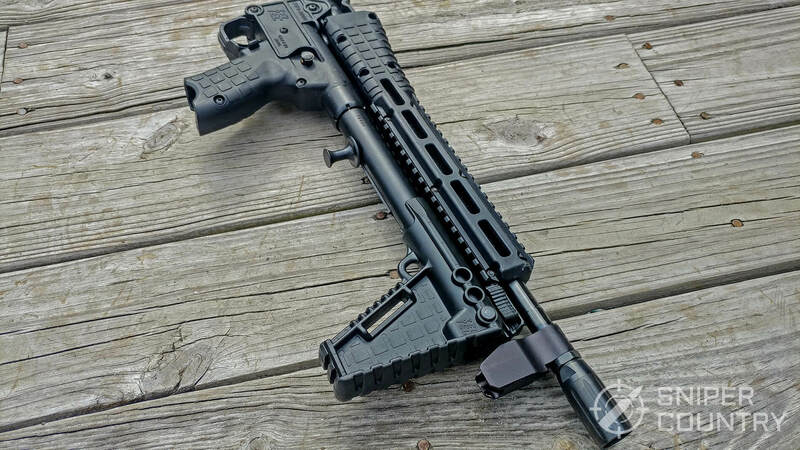 The Kel-Tec Sub 2000 is a pistol caliber carbine that’s available in both 9mm and 40 S&W. The model we are looking at today is the 9mm variant. This is a blowback operated gun that uses a very basic tube design that was popular with early SMGs. The Sub 2K has a 16.1-inch barrel and weighs about 4 pounds unloaded. The gun has an overall length of 29.5 inches but also has an adjustable three position stock. 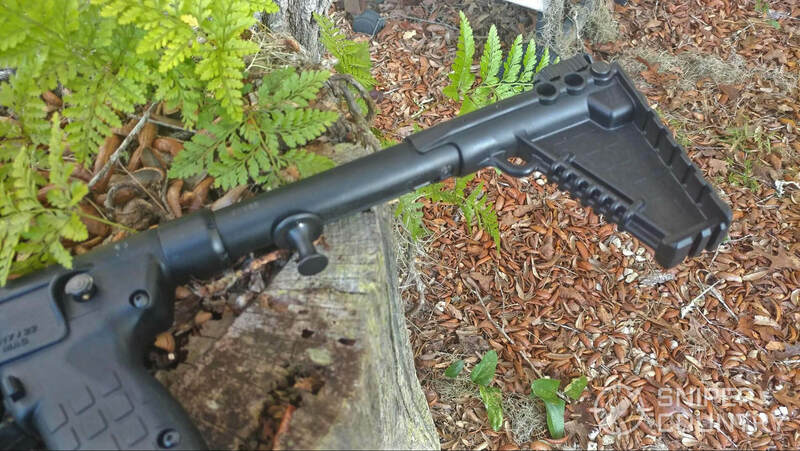 The Kel-Tec’s magazine is located in the grip, and the grip length can vary depending on the model of the gun. 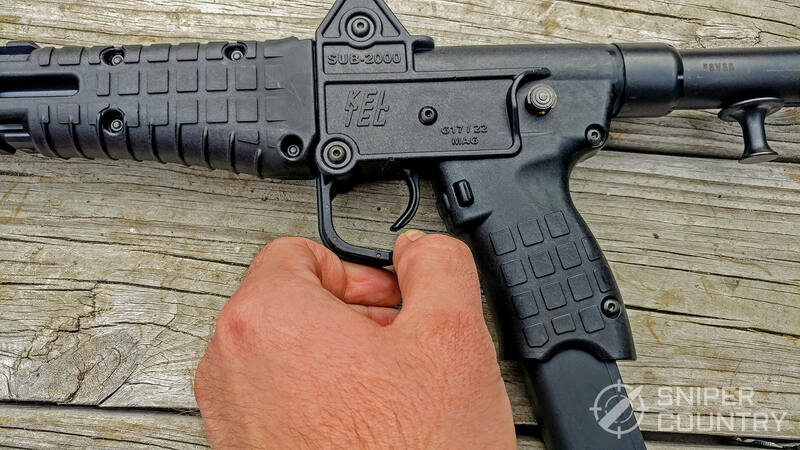 The Kel-Tec SUB 2K is made mostly of polymer, but this isn’t an issue. Most modern guns are made with a healthy dose of polymer. Polymer helps reduce the weapon’s weight and keeps it at that sub-5-pound mark and makes it an easy to carry and handy little gun. Trying to find the exact capacity of this gun is difficult due to caliber and magazine differences. They could range from 10 rounds to 50 rounds depending on the magazine and caliber. 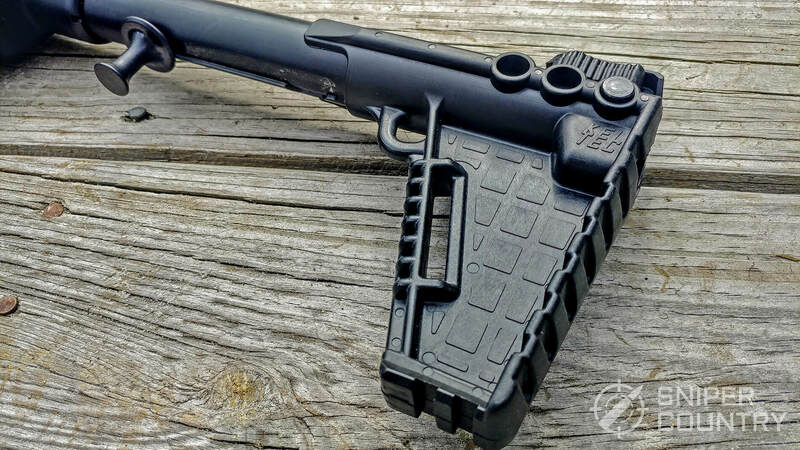 The Kel-Tec Sub 2000’s most standout feature is the fact it can fold in half. The barrel folds over the top of the gun and reduces the overall size to 16.25 inches when folded. This makes it an incredibly small and compact rifle in it’s folded configuration. This folding feature makes the gun small enough to fit into a briefcase, a concealed carry backpack, or nearly anywhere you want it to. The term compact rifle was made to apply to the Kel-Tec Sub 2000. To fold the gun you pull forward on the trigger guard, and it unlocks the mechanism. Fold the barrel over the receiver and stock, and it locks into place. To fold the gun back into its firing configuration you open the barrel via a small push lever and bring the gun back into action. Additionally, the Sub 2K has a variety of models that take a variety of different magazines. My model takes Glock 17 magazines. Kel-Tec also makes rifles that take Glock 22 magazines and compact grip models that take Glock 19 and 23 magazines. 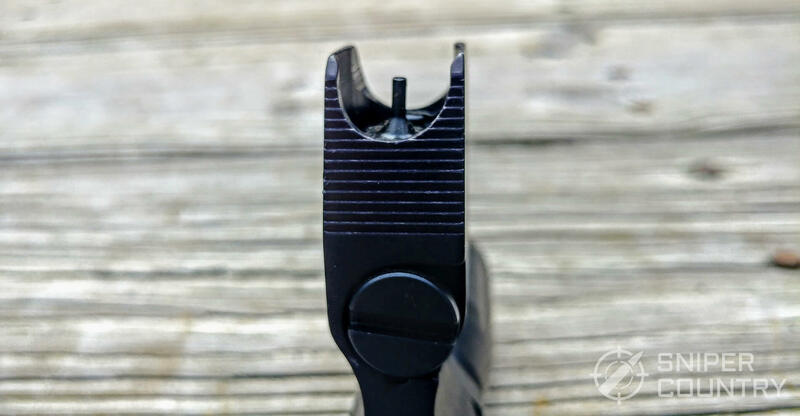 It goes even further than that though, and some models can utilize S&W M&P magazines in 9mm and 40 cal, SIG Sauer P226 magazines in 9mm and 40 cal, and finally models that can use Beretta 92 and 96 magazines. The magazine compatibility doesn’t stop there. 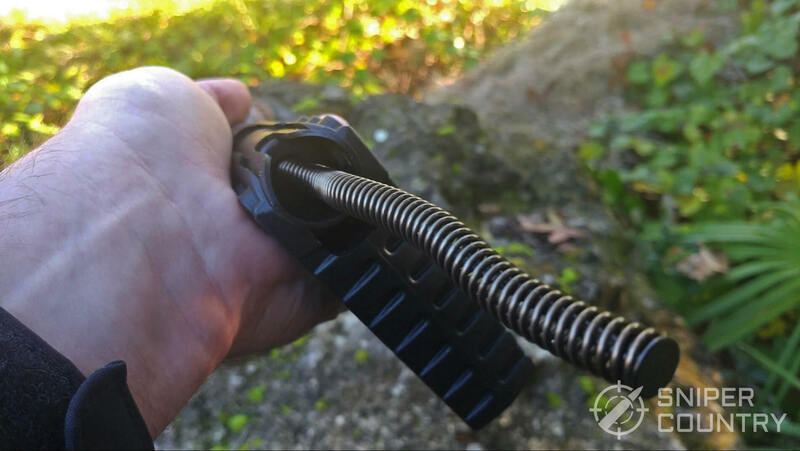 Kel-Tec also sells additional mag catches that allow you to swap your magazine compatibility. I can purchase a Glock model Sub 2000 and buy a mag catch kit for the SIG P226. After a quick install, my gun can now use P226 magazines. Kel-Tec sells additional magazine catches for the S&W 59 series and the Canik TP9 series of pistols. The Gen 2 model addressed numerous weaknesses with the Gen 1 platform. The main complaint addressed was modularity. 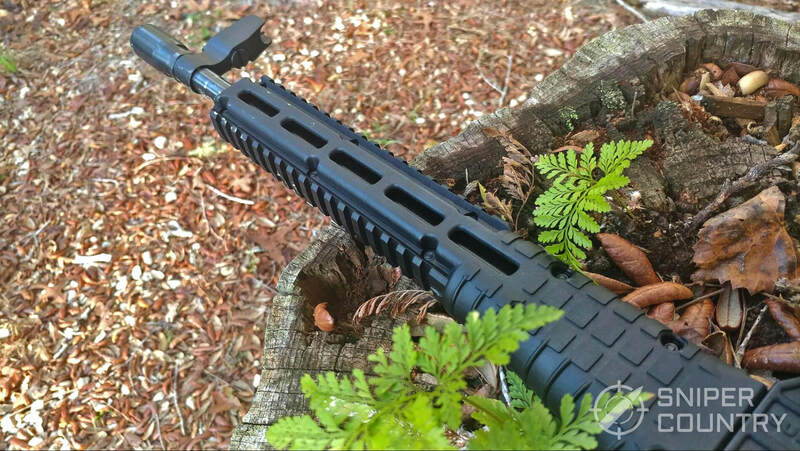 The Gen 2 comes equipped with an M-LOK handguard with a full-length bottom and top rail section. The barrel is threaded for 1/2×28 thread types so it can readily accept a suppressor or a muzzle device. 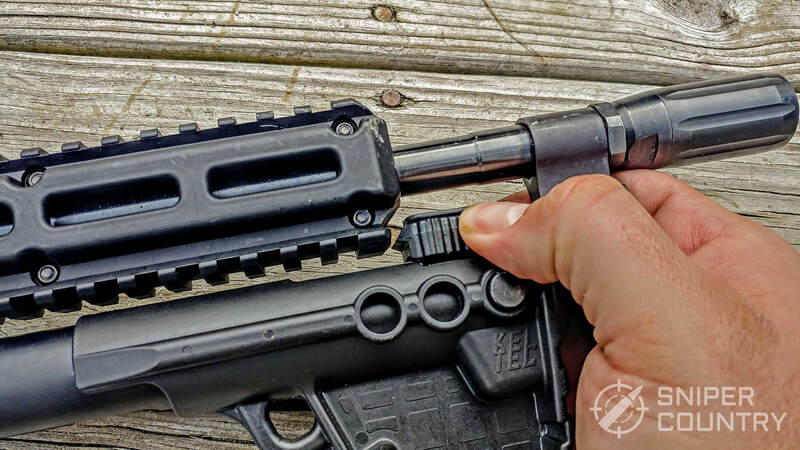 The stock is adjustable to three positions, but it’s not an AR stock, and you have to remove a pin, move the stock and then insert the pin again. Luckily the rifle has issues folding with the stock in any position. 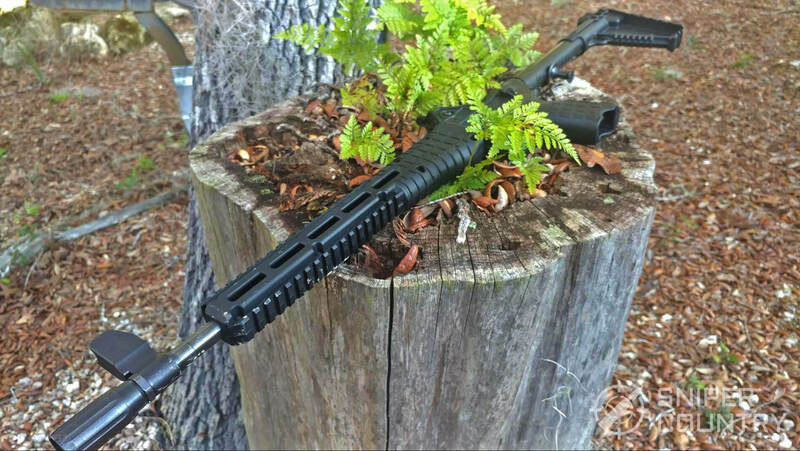 Why would you ever choose a pistol caliber carbine over a regular rifle? That question gets asked a lot whenever these guns are brought up. There are a few reasons. It’s cheaper to shoot, can be used at all indoor ranges, low recoil, easy to suppress, and more. However, I think the Sub 2K is an answer to that question in and of itself. Most rifles can’t fold in half and the few that can are expensive and still much larger than the Sub 2K. Its purpose is to be a compact rifle that’s easy to carry while adventuring or stored in a car with ease. 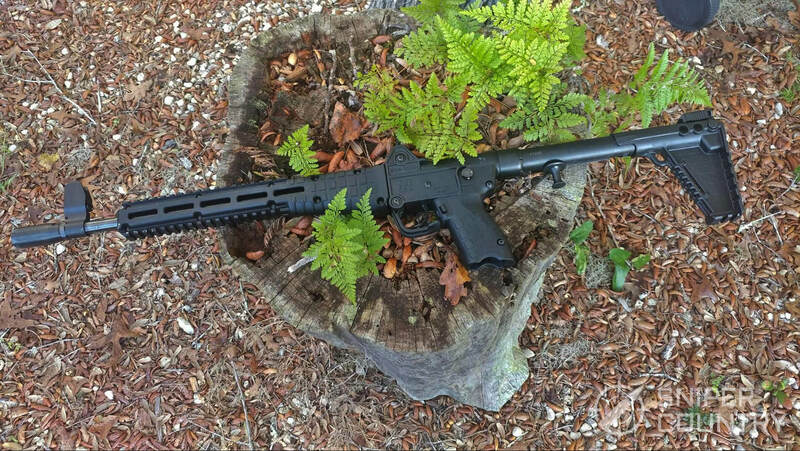 The Kel-Tec does things with size that no other gun has done. If you are looking for an affordable and reliable truck gun, here you go. If you want a gun that’s got more range than a handgun, but is easy to carry on hikes, here you go. When you are designing a rifle like this, there are certain ergonomic losses you have to take. The Kel-Tec is not MP5 when it comes to ergos. The charging handle is located in the stock of the gun, in the metal tube. Because it’s a blowback gun, it has a nice heavy spring you are going to have to overcome to rack the weapon. The location makes it burdensome, and the heavy spring doesn’t make it the easiest. The safety is placed way above the firing hand and in an awkward spot. It is a simple cross-bolt safety, so all it needs is a quick press. The magazine release is located right behind the trigger and is easy to press, so points for that. 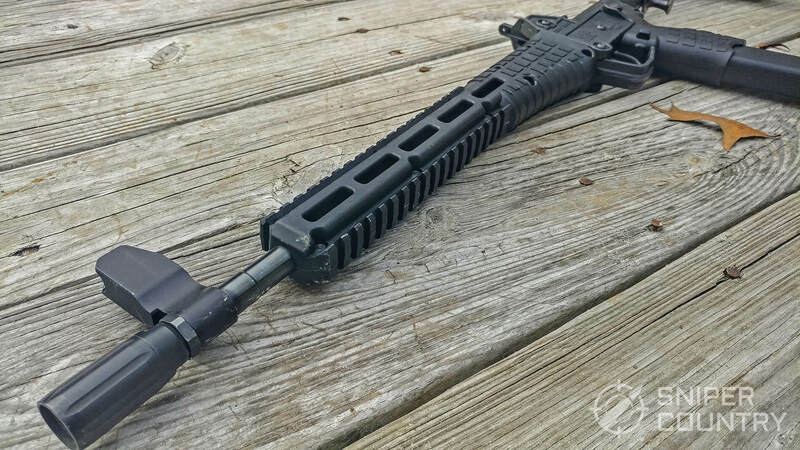 The handguard is thin, but this isn’t an issue. Even after a few hundred rounds, it’s not too hot to hold. The bottom rail never has the cheese grater feeling, which I imagine is mostly due to the low recoil of 9mm. The trigger does leave something to be desired. It’s roughly 9 pounds and has a gritty feeling pull. The gun is maxed out range wise at 150 yards and at this range, the trigger isn’t sorry enough to disturb your accuracy, it’s just not pleasant. 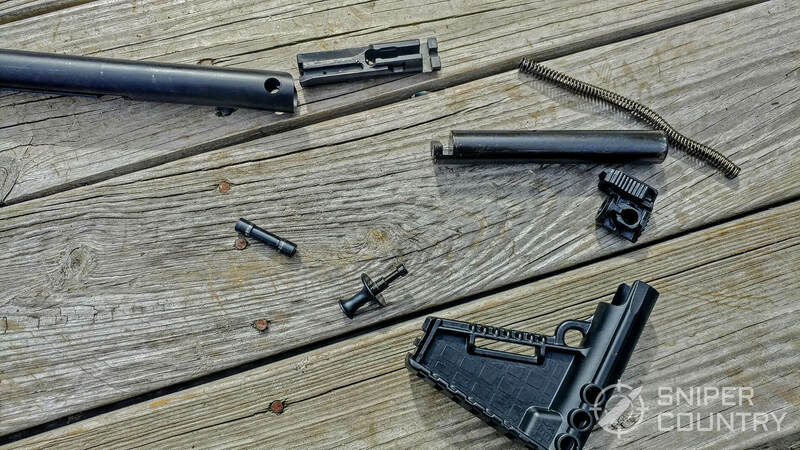 The Kel-Tec Sub 2000 is a simple gun in both operation and disassembly. The first step is to ensure the weapon is unloaded and clear. The rifle needs to be in its firing position to disassemble the gun. The bolt also needs to be forward. 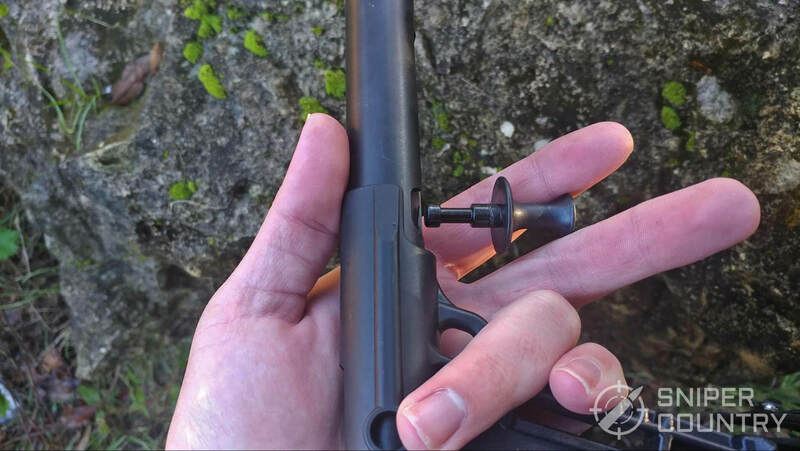 At the rear of the gun is a stock pin that you need to remove. To do so, you need the press the buffer assembly in. Once the buffer assembly has been pressed, remove the pin by pulling it out the right or left side. You can use a screwdriver, dowel rod, or another small tool to do so. Keep the buffer assembly pressed in, or it may fall out without the stock pin in place. Put the stock pin down and pull the buffer assembly rearward to remove it. Next pull the bolt assembly back via the charging handle and remove the recoil spring. Pull downward on the charging handle, and it will come free. The bolt assembly can now slide out of the rear of the gun. The bolt head can be removed from the bolt by merely pressing upwards. To reassemble follow the directions in reverse. The Sub 2000 has a real cult following and from this following a small, but an excellent aftermarket has appeared. The aftermarket does aim to increase the quality of the weapon and address most concerns. I haven’t done any real customization to mine besides adding a Linear Compensator from Kaw Valley Precision. 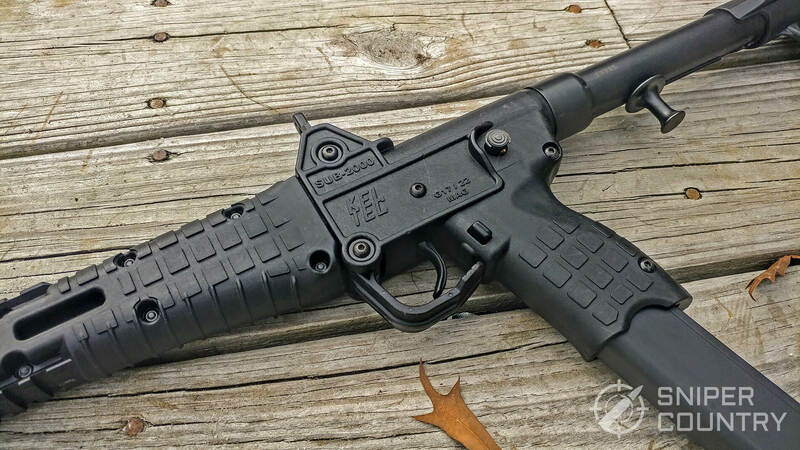 The name in Kel-Tec customization is Mcarbo, a small company that a has a dedicated Sub 2K upgrade package. This includes a better trigger, better rear sight, better trigger guard, muzzle brakes, an extended charging handle, extended magazine release, and I can keep going. They make a ton of accessories and upgrades for the platform to address its weak points. 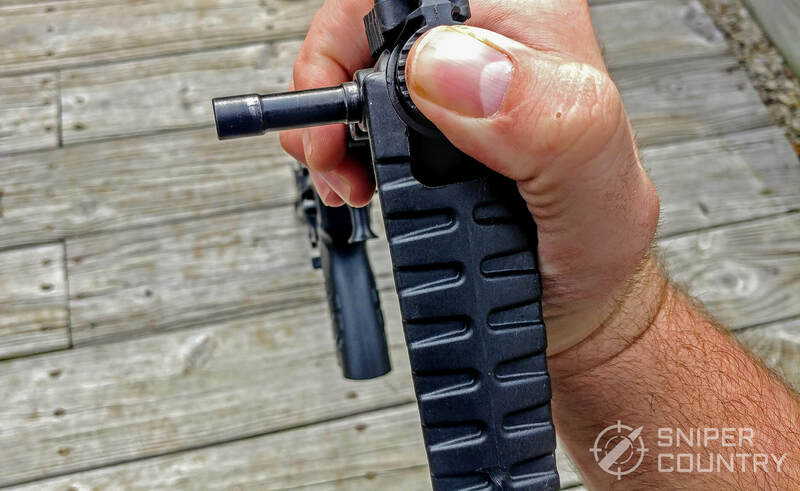 The Kel-Tec’s rails also make adding accessories easy although too many may defeat the purpose of a light and handy rifle. 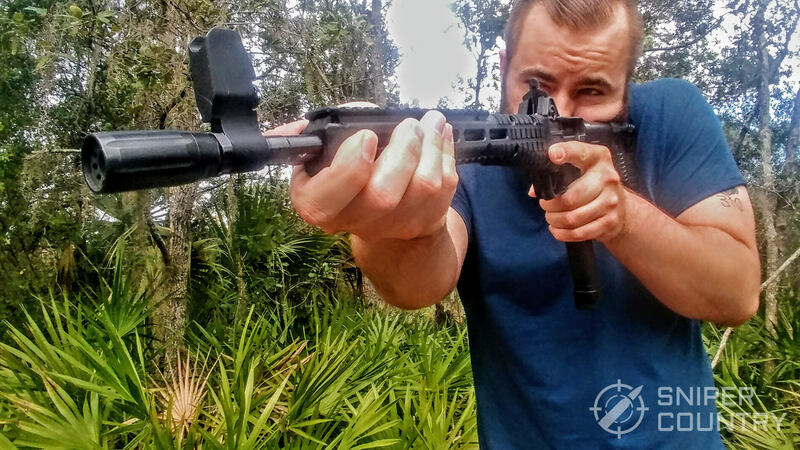 Like all weapons, it can certainly benefit from an optics (Best Red Dot Sights), and Midwest Industries even makes a mount that allows you to mount an optic and retain the weapon’s folding ability. Range time is the best time, and the Kel-Tec is such a fun gun to shoot. The first thing you notice is the heavy and gritty trigger and after that it’s all recoil. 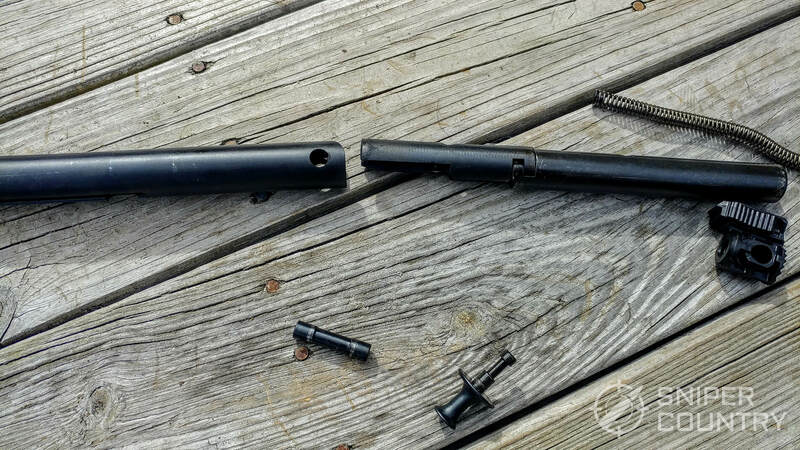 This gun does recoil more than you think it should, but that’s the issue with a blowback gun. It’s not bad, or harsh, or anything, just a little surprising. Muzzle rise is practically nil, and the gun is excellent for smaller shooters, especially kids. The tube offers hardly any real cheek weld and could be a slapper with 40 S&W guns. In 9mm it’s slap free and comfortable every day but a cold one. Sights are both good and bad. 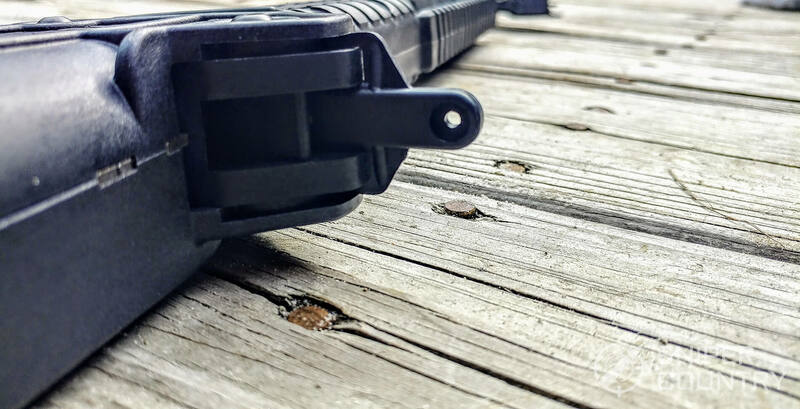 They are a peep sight which is excellent, and the front sight is a standard AR-15 front sight, which makes it modular. The biggest issue comes from the rear peep sight is very small. Small peep sights are generally preferred for more precise shooting, but I question the amount of accurate shooting you’d do with a gun like this. They should have opened the rear sight up a bit more. This gun handles like a dream. It just so much fun to shoot. It’s lightweight, light recoiling, and I feel like I can write my name with it. I have a small steel target, and out to 50 yards, I can ring it over and over again with rapid fire. If you had to use the weapon defensively, you wouldn’t have issues hitting a man-sized target out to 150 yards. Not only that but it’ll be easy to hit him over and over again with the light recoil and muzzle rise. 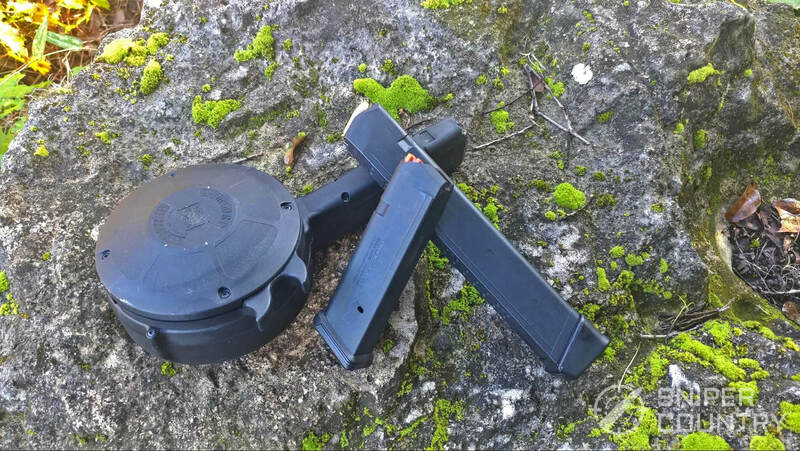 I personally love the Glock mag model because I can use affordable magazines of varying capacities from the standard 17 rounders to a 50 round drum. Not to forget the always cool looking transparent ETS magazines with their 31 round capacity. After a few years of ownership, I can say the Kel-Tec Sub 2000 seems to be an incredibly reliable gun. It has handled everything from cheap steel ammo from an unnamed European country to your best self-defense ammo. I’ve totaled malfunctions to 5 total, and they were all one brand of ammo from Freedom Munitions. Reliability is one of the benefits of a blowback operated gun. It’s as simple as a sledgehammer. It’s not the classiest or smoothest of designs, but it is functional and reliable. The gun lacks refinement overall, but it’s not a bad gun. It does have a few issues we should point out. The first is as a blowback gun it gets quite dirty. Once you break it down, you’ll be surprised by how filthy it is. Good news is that blowback guns rarely fail due to being dirty. The trigger is also a downside. A nice smooth trigger would make this a much more fun gun to shoot, but we have 9 pounds of pain to contend with. 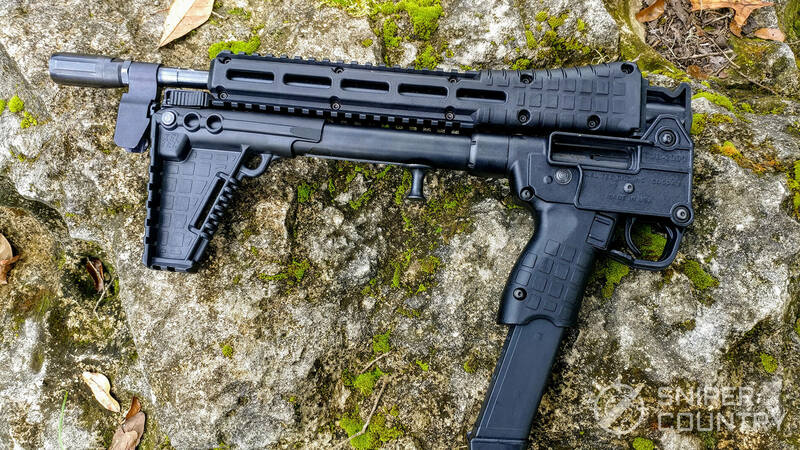 The Kel-Tec Sub 2000 is a fun gun that, as far as I know, is the only gun that can fold in half, feed from popular magazines, and be on sale for less than $400. The Sub 2K is a fun shooting little gun that is a great contender for a truck gun, or hiking companion. 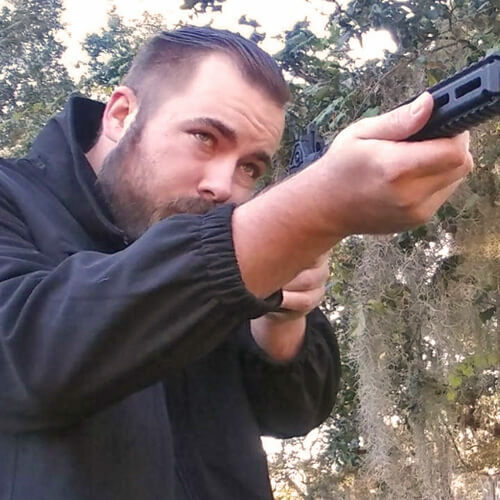 It’s dead nuts reliable, easy to disassemble, and its low weight, recoil, and muzzle rise make it an excellent choice for teaching new shooters how to handle guns more significant than a 22. 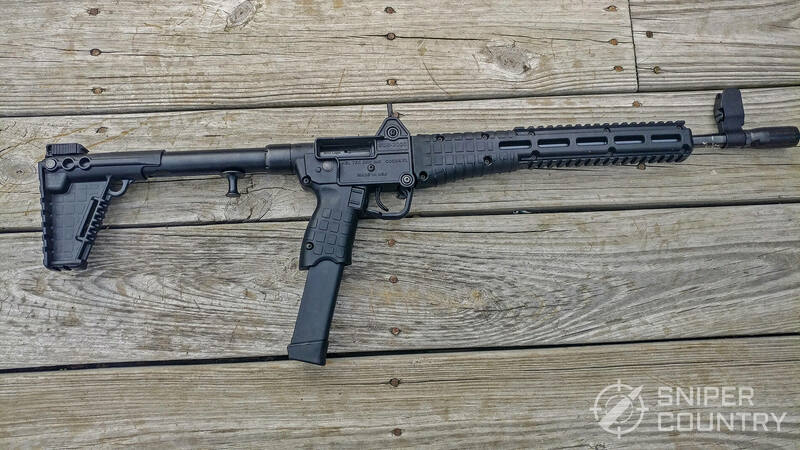 The Kel-Tec Sub-2000 is one of the coolest weapons I own and will be sitting in my collection as long as I have it. Thanks for the info. I’ve been interested in this weapon for a while and you just told me & sold me, good & bad. Good piece of objective commentary. I remember how it was an exciting day when Dad would take us shooting and I definitely want to have my grandchildren experience the same feeling. Thanks for your feedback and the additional information Mitch. We’ll update this review when we get our hands on the aftermarket trigger. Up until then, there are more than 200 reviews (average 4.94/5 stars) on the Mcarbo website, you can read them here. Great evaluation and insights of Sub 2K Travis. I’ve upgraded my Sub 2K with Mcarbo: all inside guts/steel screws outside. I use red dot for matches in PCCO division. I’m on fence about mussel brakes. Yours has compensator; slime looking. Mcarbo has fat brake. I can’t find a reviewed on neither.